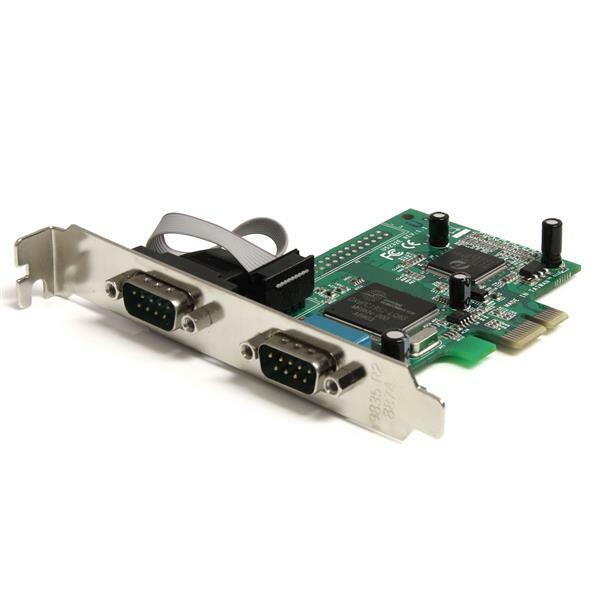 The PEX2S950 2 Port PCI Express RS232 Serial Adapter Card with 16950 UART can be installed into an available PCI Express slot, to provide two high performance 16C950 RS232 serial UART channels/ports - a convenient solution for connecting modern or legacy serial devices with support for data transfer rates of up to 460 Kbps. 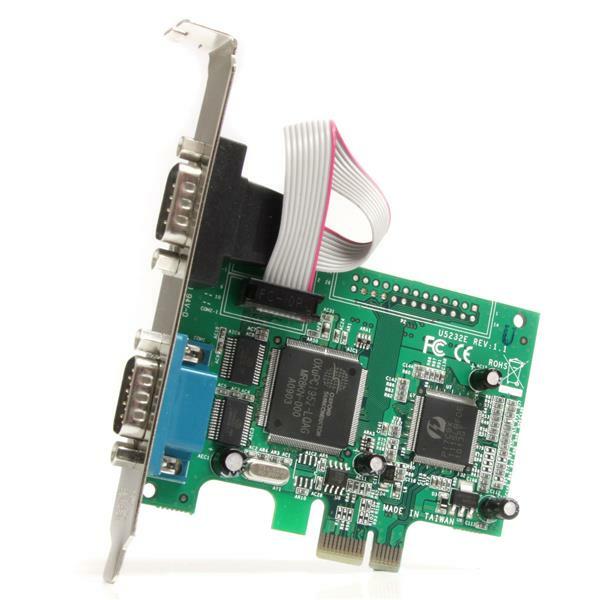 The 2 port RS232 serial card is easy to install and configure, with support for a broad range of Windows® operating systems. Plus, the card features IRQ sharing and supports plug and play serial device connections, guaranteeing convenient, hassle-free installation. Backed by a StarTech.com lifetime warranty and free lifetime technical support. How do I install my serial card in Windows Vista / 7 / 8 /10? Before you install the device, make sure that your operating system is current (for example, the most recent service pack is installed). Download the latest drivers from the StarTech.com website at http://www.startech.com/Support. The part number and product ID are on the product packaging. Note: Windows usually saves the files to the Downloads folder that is associated with your user account (for example, C:\Users\your_name\Downloads). After the download is complete, right-click the zip folder that you downloaded, click Extract All, and complete the instructions. Press the Windows key + R, type devmgmt.msc, and press Enter to open the Device Manager. Right-click PCI Serial Port, which will have a “!” or “?” next to it to indicate a driver issue. Select the Let me pick from a list of device drivers on my computer option. On the Select your device’s type from the list below screen, click Show All Devices, and click Next. Note: The Select your device’s type from the list below screen does not appear on all systems. If you do not see this screen, skip this step. Select the Have Disk option. Browse to the Windows folder, select the folder for your operating system, and open the 32-bit or the 64-bit folder, depending on your system type. Note: To view your system type, click Start. Right-click Computer, and then click Properties. Click the OxMf or OxPCIeMf file. Click OK, and then click Next. Note: If you are using a serial card that uses the OxPCIeMf file and installation fails, repeat steps 4 to 9, then browse to the Windows folder. 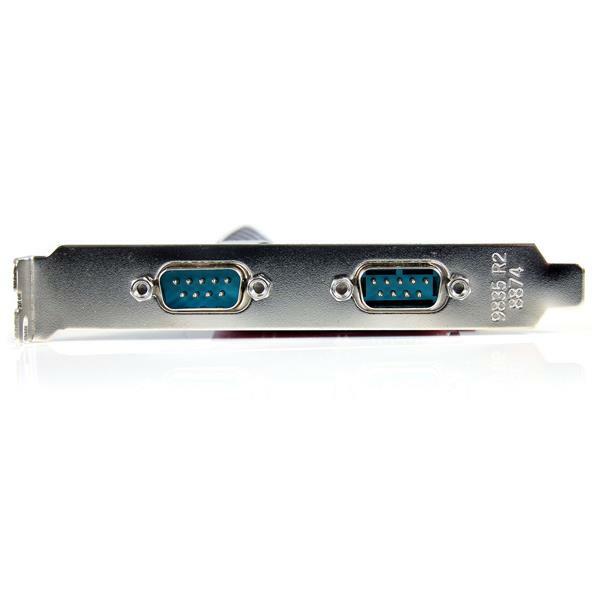 Browse to the Serial Port Driver folder and click the oxserleg file. Click OK, and then click Next. How do I install my serial card in Windows XP? Note: Windows usually saves the files to the Downloads folder that is associated with your user account (for example, C:\Documents and Settings\your_name\My Documents\Downloads). Right-click PCI Serial Port, which will have “!” or “?” next to it to indicate a driver issue. On the Hardware Update Wizard screen, click Install from a list or specific location (Advanced), and then click Next. Select the Don’t search, I will choose the driver to install option, and then click Next. On the Hardware Type screen, click Show All Devices, and then click Next. Note: The Hardware Type screen does not appear on all systems. If you do not see this screen, skip this step. On the Select the Device Driver you want to install for this hardware screen, select the Have Disk option. In the Install from Disk dialog box, click Browse. Note: If you are using a serial card that uses the OxPCIeMf file and installation fails, repeat steps 4 to 10, then browse to the Windows folder. Browse to the Serial Port Driver folder and click the oxserleg file. Click OK, and then click Next. How do I confirm that Windows detects my expansion card?